Simply honest. It’s not only our basic philosophy, simply honest is also our business model and innovation code. Easy, transparent, accessible and friendly -that’s the easyMarkets way. We have tried to make the process of trading as simple as possible. One of the first to offer online trading, our platform was developed to be as user-friendly as possible and ensure it is still powerful and versatile enough for experienced traders. We never adjust our trading conditions in response to market volatility. Fixed spreads and no slippage on our web platform means you know your costs before trading. We are regulated by both CySEC in Europe and ASIC in the Asian Pacific Region. We believe in transparency and we are proud to be a market maker. Trading is never disabled during market volatility or important economic calendar events. Even during extreme events like the Swiss Franc peg removal, the Brexit referendum, the Trump electoral win or the insane moves of the cryptocurrencies. The easyMarkets founders back in 2001 recognized that there was a complete lack of democracy in trading. Simply put; it was the banks, or nothing. The requirements for successful trading involved having enough capital (often meaning tens of thousands of dollars) to ward off issues such as wide spreads and slippage. 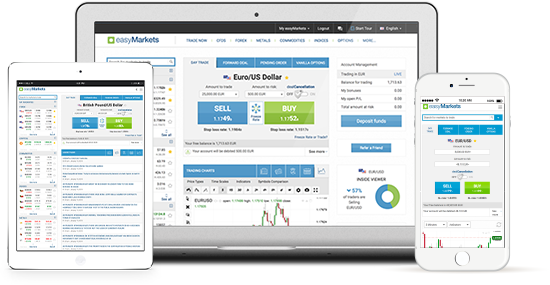 We changed that by opening forex trading up to anyone and everyone who wanted to be involved. Back in 2001, the industry only offered Forex trading, which we fundamentally changed as well. We made trading more accessible by allowing traders to deposit just $25 via credit cards. Our customers found this system favourable, and responded with their loyalty -in turn, helping us grow. Subsequently, Our CFD offerings would grow to include indices, energy, metals, cryptocurrencies and more. Because of this diversification of services, we rebranded from easy-Forex to easyMarkets.